At Petplan Equine we understand first-hand how rewarding horse riding and ownership can be and from experience we think most domesticated horses enjoy the company of their human companions. 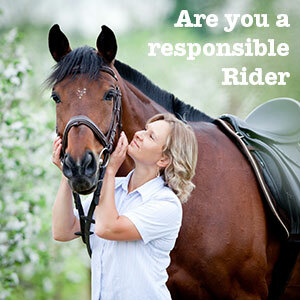 Take our Responsible Rider quiz to find out how your attitude towards your horse’s health and welfare rates and to help make sure your horse is happy and healthy. 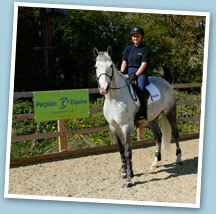 Plus, pick up some great advice from Petplan Equine’s expert partners. You bring your horse in from the field and he is walking slowly and looks uncomfortable. You have noticed your horse coughing a few times especially when you start to do faster work. You want to take your horse on a 10 mile fun ride but you haven’t ridden him much lately and he is unfit. You take your horse show jumping. The ground-is hard and he is unusually reluctant to jump, refusing on a couple of occasions. You’ve just got back from a fast gallop. You are invited to join a group-schooling lesson at the yard but you have schooled your horse for the past five days in a row and he is getting bored. Having just bought a new horse you are considering whether or not to insure it. Resolve to put aside money every month in case he needs treatment. He’s just cost you more than you planned to spend and how likely is it that he will get injured in the first year you own him anyway? Your usually well-behaved horse begins to nap and buck when ridden. After a number of successful competition results you decide it’s time to move up a level. You’re riding along a very narrow windy lane and there is a car behind you that is trying to pass. You and your friends are going on a sponsored ride but your horse can be quite excitable in company. On the way to an event you get caught up in traffic. You are hacking along a bridleway when you come across someone walking a dog off the lead. The dog is running towards you. You notice yellow flowers that could be ragwort in your field. You’re about to take your horse out for a ride and you notice that unwelcome, familiar clinking sound of a loose shoe. Horses can be very rewarding but like any animal they need daily attention and the right environment. Healthy horses are generally happy in their work so it is important to look after your horse properly and always ask for advice if you are not sure. Remember that your horse is an athlete and needs to be fit enough for the activity you want to do — so be patient and don’t let your own aspirations override the welfare of your horse.